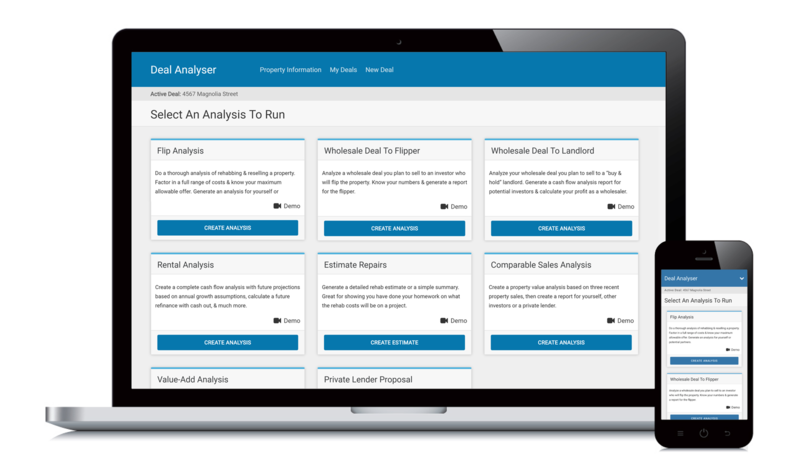 Real estate investment analysis software for Flippers, Wholesalers, Rehabbers, Landlords, and Real Estate Agents. Calculate potential real estate investments quickly and easily even if you are a beginner. Analyze your next deal or simply start using it as a learning tool now. Cloud-based software compatible across all your devices allowing you to analyze real estate investments anytime at home, at the office or in the field. Calculate the maximum amount you should offer so you don’t over pay for a deal. Determine potential profit & analyze multiple exit strategies including Fix & Flip, Wholesale, Buy-&-Hold Rental, Value-Add, BRRRR, or House Hack. Build your confidence & learn. 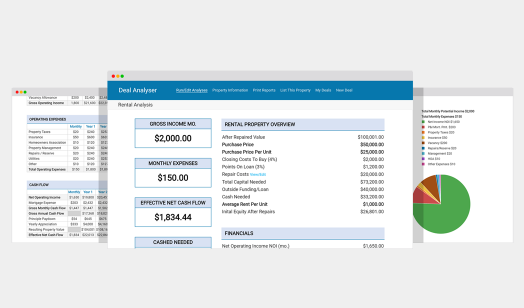 Our real estate investing software allows you to calculate offers quickly & easily even if you are a beginner; then create detailed marketing & analysis reports which help you to sell your deals faster & for more money. Get your project funded quicker by impressing potential lenders or partners with a colorful PDF investment proposal. Look like a seasoned professional even if you are a beginning investor. Run multiple analysis reports at one time on the same property. Create a complete cash flow analysis with future projections based on annual growth assumptions, calculate a future refinance with cash out, & much more. Analyze a wholesale deal you plan to sell to an investor who will flip the property. Know your numbers & generate a report for the flipper. Analyze your wholesale deal you plan to sell to a “buy & hold” landlord. Generate a cash flow analysis report for potential investors & calculate your profit as a wholesaler. Generate a detailed rehab estimate or a simple summary. Itemize rehab costs & create beautiful detailed repair estimates you can print as a stand-alone report or incorporate with another analysis. Used for analyzing multi-unit properties. Calculate the value added (or “forced equity” generated) by increasing rents, lowering the vacancy rate & expense ratio, & based on various cap rates. Print a professional looking investment proposal for potential hard money & private lenders. More easily secure funding for your deal by providing detailed project costs & projected returns.